For those of us who like to make stuff, we know that where we can, it’s often best to sew it yourseIf. But even if you don’t need convincing, how do you explain this to other people? Sometimes sewing things yourself might not seem to make any sense. Fabric can be expensive and making things takes time (sometimes a lot of time!). Throw away fashion and Chinese imports are cheap and easy to get hold of. So why bother making things at all? If you’re scratching around trying to find a reason, here are 19! There are probably lots more I haven’t thought of, so if you can think of some more, please add them in the comments! 1. Sewing things yourself is fun! This is the main reason, and if it wasn’t, we wouldn’t bother! 2. It’s good for your mental health. Doing something creative makes you feel good, reduces stress and boosts your confidence. Because of their benefits to mental health, crafts are even used sometimes as part of ongoing treatment for depression and PTSD. 3. Making things is good for your physical health. It is believed to help reduce high blood pressure as it helps people to relax, and even has been reported to help with insomnia and pain relief. 4. In older people, doing something crafty regularly is believed to help reduce short term memory loss. 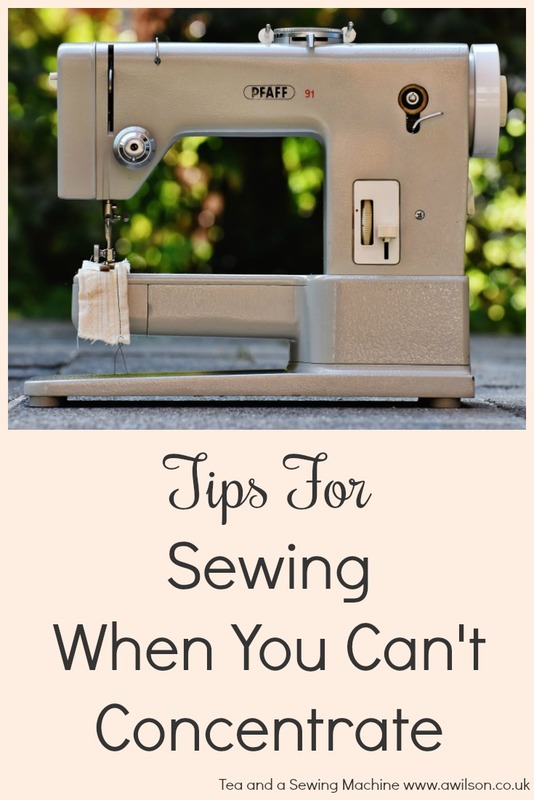 If you’re interested in reading more about the health benefits of sewing, you might like to read this post here. 5. You can make things in whatever colour you like. When out shopping, if you see a dress or a top you like, it might be available in 2 or 3 colours if your lucky. But if you sew it yourself, you can choose the fabric in any colour or print! 6. You’re not restricted to a particular style. If you like vintage tea dresses but the fashion people are telling us it’s all skinny jeans and big jumpers, it doesn’t matter! You can make yourself what ever you like, in a style you love and that suits you. 7. You can make something exactly how you want it. When you go clothes shopping, you might see something you like, except it’s not long enough, you don’t like the buttons or the colour’s horrible. If you make it yourself, you can make it the length you want and choose buttons you like! 8. When you make your own clothes, you can make them to fit properly. There’s no need to buy things that are baggy around the top just so that they fit around the middle, or trousers that are the right length but too wide at the waist! 9. You can make something for a specific purpose. No more trawling the shops for hours because you need an outfit that makes you look like Wonder Woman, or a bag where there’s space for your ipad and separate pockets for your kid’s rocks and your phone. When you make it yourself, you can start with your most important requirements and take it from there. 10. Things can be personalised. You can add a name or initials, or add whatever extra details you like. 11. Things can be made to match. If you have beautiful curtains you love, or Orla Kiely sheets , you can make other things to go with them that might be out of your price range or simply don’t exist in the shops. If you sew it yourself, you can make a sewing machine cover that matches your curtains or a bed for your cat that compliments your own. 12. It can be an opportunity to upcycle things you no longer need. Upcycling old jeans is a big thing at the moment, but they’re not the only thing that can be reused. All it takes is a little bit of imagination to turn something old into something new! 13. Although it’s not cheaper to make clothes than to buy them, you may well end up spending less overall. Cheap clothes often result in more impulse buys. If you buy something on impulse, you’re probably less likely to wear it. A wardrobe full of impulse buys means a wardrobe full of clothes you don’t wear, resulting in more shopping trips! If you make your clothes yourself, the individual outfits probably won’t cost less, but you’re more likely to make something you actually love to wear. So in the end, you have less outfits and you wear more of them. This is going to be cheaper than buying tons of cheap clothes, then donating them to a charity shop or throwing them away. 14. This results in less throw away fashion ending up in landfill. You’ll make something you love and wear it a lot more. Definitely a good reason to sew it yourself! 15. If you like designer gear, sometimes it is cheaper to make it yourself. You might be able to find fabric that’s similar and make something in the same kind of style. 16. Nobody is exploited in the making of your clothes. Due to the publicity about children working in sweatshops for 50p a week, retailers have had to start addressing this issue. But at the moment, unless you buy fair trade clothes , there’s no way to know for sure. So another way round this is to sew it yourself. 17. It helps to keep skills alive. Crafting has made a comeback over the last few years and people have taken up sewing, knitting and crochet now. Before this, they were hobbies largely enjoyed by older people, and it would be sad if these things were forgotten and lost. 18. Making things can be a chance to meet like minded people. From classes, to knit and knatter, to chatting to people at the fabric shop or even finding mums at a birthday party that also like sewing! I’ve also found that blogging about sewing has led to meeting lots of like minded people online. 19. If you’re good at making things, you might be able to make money from your hobby. Even just making a bit can help. Sometimes it means that people to earn a bit while at the same time as taking care of children or managing other commitments. 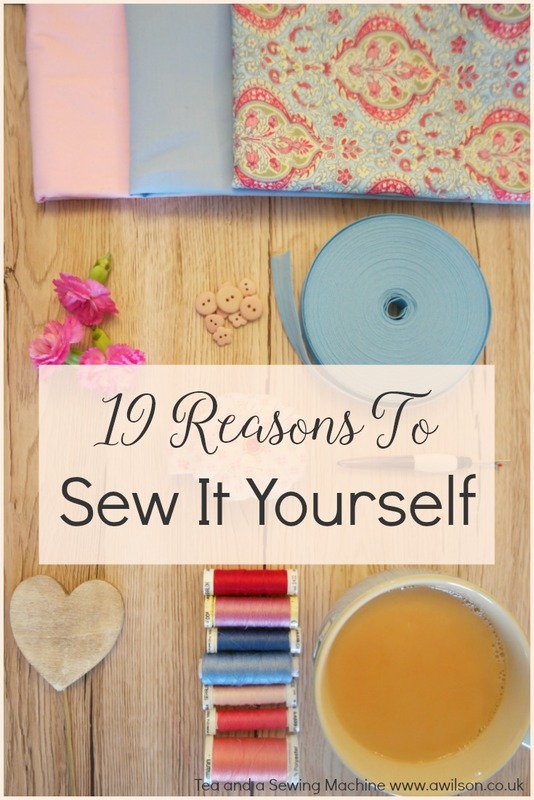 If you can think of some other reasons for why it is best to sew it yourself, please add them in the comments below!